Just over 80 people attended and approximately $2,000 was raised October 23 at the dinner and silent auction held for the new Joshua’s House at Mid Michigan Community College. Another $2,000, earmarked for “capacity building” or training for maternal staff and administration, was presented to the organization from the Clare County Enterprise Community. 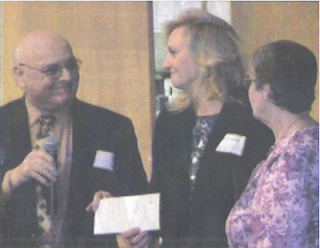 Shown here Jerome Burger, CCEC Executive Director presents the $2,000 check to Renee Jeffords founder of Joshua’s House. On the right is Sharon Bidigare, president of the CCEC. “It went really well,” said Jeffords. She said the funds raised by the dinner, silent auction and offering will be used towards the down payment for a location for the organization, which will offer a temporary home, classes and medical services for pregnant young adults.